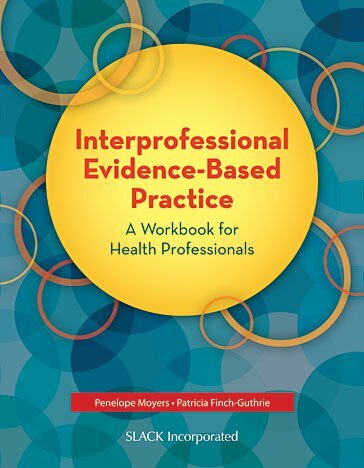 Interprofessional Evidence-Based Practice: A Workbook for Health Professionals promotes active, team learning of interprofessional evidence-based practice (EBP). This text is distinctive in that it departs from the tradition of EBP occurring from a single disciplinary perspective. Interprofessional EBP is described in terms of a dynamic team process that blends the patient’s preferences and values, and the expertise of practitioners from multiple disciplines, and incorporates multidisciplinary evidence. Teams learn to use the nine phases in the interprofessional process to challenge current disciplinary paradigms and biases to create an integrated approach to patient care, health care delivery, or population health. The text provides detail for developing and launching an interprofessional EBP program that goes beyond the evidence process to include implementation science to support practice change. Approaches for developing partnerships for supporting this type of program between universities and health care institutions are contained within, including sample partnership agreements and resource-sharing strategies. Inside Interprofessional Evidence-Based Practice: A Workbook for Health Professionals, each chapter includes performance objectives, key words, checklists, and materials and resources that an interprofessional team can use. PowerPoint lectures, mentor newsletters, forms, tools, and other resources are included on a companion website to guide team learning about key EBP topics, as well as to support the program coordinators and team mentors in their work with the interprofessional teams. Interprofessional Evidence-Based Practice: A Workbook for Health Professionals is the go-to resource for those who want to engage in interprofessional EBP, and for leaders who want to develop and implement an interprofessional EBP program. Penelope A. Moyers, EdD, OT/L, FAOTA, more often called "Penny," is the Dean of the Henrietta Schmoll School of Health and the Graduate College at St. Catherine University in St. Paul, Minnesota, and is a Professor of Occupational Therapy. The School of Health has over 35 programs in a variety of health professions and has provided Dr. Moyers an opportunity to observe how different professions learn and work together. She was the Department Chair for Occupational Therapy at the University of Alabama at Birmingham and was a Dean of the School of Occupational Therapy at the University of Indianapolis in Indiana. Penny is a Fellow and a past president of the American Occupational Therapy Association (AOTA), received the association’s Award of Merit, and is board certified by AOTA in Mental Health. Penny received her BS degree in occupational therapy from the University of Missouri in Columbia and has over 30 years of experience in the field. She went on to the University of Louisville in Kentucky, where she received an MS degree in community development. Her EdD is from Ball State University, Muncie, Indiana, in adult education. Her clinical expertise is in the areas of mental health, substance use disorders, HIV/AIDS, and upper extremity rehabilitation. She has published extensively on the occupational therapy interventions for persons with substance use disorders and those with co-occurring disorders. She also has expertise in the continuing competence of health care professionals and has authored many articles and book chapters on this topic.In her role as Dean at St. Catherine University, she co-founded the Interprofessional Clinical Scholar Program with North Memorial Medical Center in Robbinsdale, Minnesota and then was invited to work with Abbott Northwestern Hospital, Minneapolis, Minnesota in their existing Evidence-Based Practice Fellows Program. Her desire was to bring groups of faculty, students, and staff together from multiple disciplines to solve problems in practice in a manner that places the patient and family at the center while considering the talents, expertise, and knowledge of professionals from multiple health care professions. Patricia L. Finch-Guthrie, PhD, RN is the Director of Interprofessional Education, Practice and Research in the Henrietta Schmoll School of Health and is Assistant Professor in the Department of Nutrition and Exercise Science at St. Catherine University. In her role, Patricia has developed and taught interprofessional courses for baccalaureate students from multiple disciplines on teamwork, team roles and responsibilities, health care teams and quality, and research and evidence-based practice. Patricia has practiced as a Clinical Nurse Specialist in Gerontology and served as the Director of Education and Nursing Research at North Memorial Medical Center in Robbinsdale, Minnesota, overseeing many interprofessional evidence-based practice initiatives. Patricia co-founded the Interprofessional Clinical Scholar Program at North Memorial Medical Center and is now working with Abbott Northwestern Hospital in Minneapolis, Minnesota as part of their Evidence-Based Practice Fellows Program, bringing an interprofessional focus to the program. Patricia received her BSN from the University of Iowa in Iowa City, a MS degree in nursing from the University of Minnesota in Minneapolis as a Clinical Nurse Specialist, and a PhD in nursing with a minor in gerontology from the University of Minnesota. Patricia has practiced as a bedside nurse in acute care for 14 years and in nursing administration for 21 years, with clinical and practice expertise in cardiovascular nursing care, the acute care of older adults, and advanced nursing practice. Patricia has published about the care of older adults regarding assessment, care planning, prevention of delirium, and decreasing pressure ulcer rates in critical care, and has served as a dissertation chair for PhD nursing students and as an advisor for master’s level nursing projects as an educator.